Leather jacket is a versatile topper that will never go out of style. It can be dressed up and down over anything at all, even dresses and skirts. In today’s post I want to show you 25 ways how to wear this outerwear piece with jeans. This combo is like vanilla ice cream that flatters any woman no matter what is her age or body shape. Leather jacket is the perfect accompaniment to jeans. Definitely don’t be afraid of this combo, all you need is to feel confidence. Scroll down to see my favorite leather jackets paired with all kinds of jeans. Keep things look vintage. 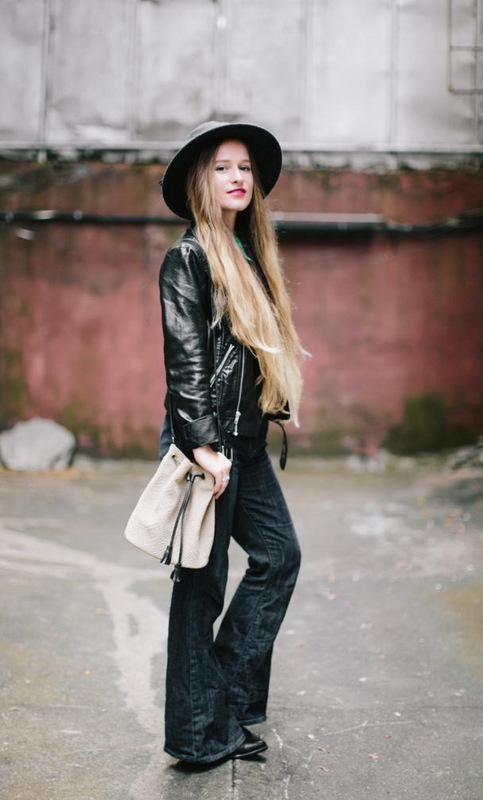 Try on black classic leather jacket and style it with flared dark jeans, wide-brim hat and bucket bag.